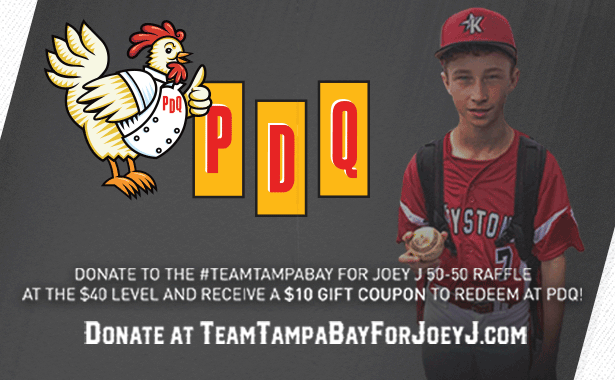 Our Tampa Bay area PDQ team is proud to partner with the Tampa Bay Sports Commission and the local sports community to assist legendary Tampa Bay sports reporter Joey Johnston and his family, after his son, Joey Johnston Jr. was involved in a tragic accident on July 8, 2018. Through August 27, funds are being raised to support the Johnston family and proceeds from the raffle are designed to help through the recovery process. For anyone who donates $40 or more, PDQ is providing a $10 gift coupon to redeem at any Tampa Bay area location. To learn more and donate, visit TeamTampaBayforJoeyJ.com.